Enjoy the best that New York City and Philadelphia have to offer. You will discover some of the hidden gems of Pennsylvania and New York State as well as visiting the spectacular Niagara Falls. Your experience will only be heightened by the wonderful Inns and B&Bs we have selected for you throughout your trip! Arrive into Philadelphia where you will pick up your rental vehicle and drive just 20 minutes to your centrally located downtown hotel. Philadelphia, the birthplace of American Independence and home of the Liberty Bell, is full of history drawing millions of visitors every year to follow the walking trail through Independence National Historical Park. The city, also a major port, has many fine museums, parks and gardens and a lively cultural scene… You have a busy day ahead of you tomorrow! A full day in Philadelphia for seeing the sights. The City of Brotherly Love is the birthplace of the United States of America. Once you have seen the Liberty Bell, the Betsy Ross House, and Independence Hall, you can explore the city’s myriad artistic and cultural offerings. Museums, exhibits, and parks present everything from Rodin to Robert Indiana, and symphonies, dance companies, theatrical groups, and pro sports teams ensure there’s an activity to keep you busy. When it’s time for a bite – why not try a cheese steak, shop at the Italian Market, check out the funky scene along South Street, or visit one of Philadelphia’s many fine restaurants. This really is one of America’s great cities. Enjoy the pace, the diversity, the food, neighbourhoods and the world renown attractions – it’s all here. Visitors love to go to Amish Country, to experience the slower pace of life and simple living. The traditions of the Amish in Lancaster County date back to the 1720s when the Old Order Amish, the “Plain People” fled religious persecution in Europe. Most Amish are not Dutch at all. The word is shortened from Deutsch, which is German. Today, the most common bond in central Pennsylvania is German heritage, although, there are also Swiss, French, English, Welsh and Scottish Amish. Holding dear traditional values, they stress humility, family, community and separation from the world. Not actually stuck in history, the Amish do change. They just examine it carefully before they accept it. Because we believe that the heritage of the Amish and Lancaster County are rare treasures, we work to deliver information that lets you explore the true byways and backroads that illustrate the most authentic and traditional way of life. You’ll enjoy the quiet serenity of these crisp, immaculately kept areas, and an opportunity to leave the region refreshed and renewed in spirit. Plan to enjoy the unique food of the Amish, the culture and quaint villages. There’s also antique shopping, craft displays and heritage centers. Gettysburg is famous as the site of the biggest battle of the Civil War – it was here that Lincoln delivered his Gettysburg Address, and generations of schoolchildren have grown up learning the significance of this small Pennsylvania town. You can almost hear the drums of war beating within the stilling silence of the land at Gettysburg where the fate of America was changed forever. The landscape has been preserved to tell the story of war, yet honour the soldiers who fought valiantly for their cause. It was at Gettysburg that the leaders of both the Union and Confederate armies who would ultimately play out the Civil War to its end, first met in gigantic and carefully strategised battles. All seemed to understand that the outcome of the war would be determined on these grounds. Whomever prevailed would be likely to conquer. In a bold attempt to invade Washington, DC from the north, the Confederate army amassed thousands of troops ready to take DC. The Union understood that the ground had to be held at whatever cost. The totally new visitors center tells the story with a dramatic crescendo. Even repeat visitors to Niagara Falls thrill to the thunder and roar as six million cubic feet of water falls over the rocks every minute. In fact, the Falls have been thrilling visitors since 1820. Sam Patch, The Yankee Leaper, began the long tradition of daredevils trying to go over the Falls in 1829. Visitors have enjoyed the view in the whirlpools beneath the Falls on the Maid of the Mist since 1846. Join the millions of travellers who every year are awed by the sights and sounds of magnificent Niagara Falls and don’t miss the illumination at night! Spend one more day exploring this Natural Wonder of the World or go beyond the falls to explore two more of Niagara Falls area very distinctive sides. Lewiston is a quaint town with shops and restaurants, where you will feel like you have moved back in time. Downtown Niagara Falls is only a very short drive from Lewiston bustling with visitors and commerce, it could not be more different. Historic Old Fort Niagara was under the control of British as well as American troops during the Revolutionary War. When you reach the Finger Lakes region, try to make as many of the “must-sees” as possible. MacKenzie-Childs, Ltd, located on a picturesque farm on Cayuga Lake, produces beautiful hand-decorated ceramics and home furnishings. Letchworth State Park, known as the Grand Canyon of the East, covers 14,000 acres along the majestic Genesee River. Scenery and waterfalls unfold throughout the gorge. Watkins Glen State Park has a descending stream that cascades 400 feet down past 200 foot high cliffs. The Strong National Museum of Play has fun for all ages. Chemung County has become known as the “Soaring Capital of America.” You can take a sail plane into the skies while enjoying some of New York’s best views. The lush waters of the New York Finger Lakes region are different than Niagara Falls, but no less beautiful. There are no less than 28 wineries in Seneca County alone and several New York Wine Trails crisscross the region. World-renowned chefs and famous winemakers come together to share their secrets at the New York Wine and Culinary Center, located in Canandaigua. Today you will leave the beautiful scenery of Upstate New York – for your destination, the one & only, New York City! Your first job is to return your rental car to the depot at Newark Airport (This eliminates the hassle of driving in busy Manhattan – where a car would be more of a hindrance than a help!). Take a cab (a yellow metered taxi will cost approx $45 – this is not included in your prepaid holiday cost) to your hotel in midtown Manhattan. 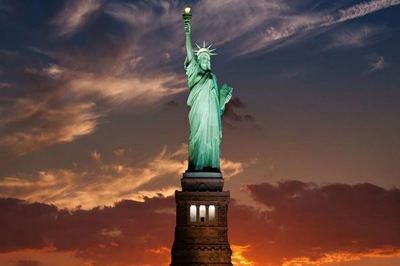 New York City is home to America’s famous landmarks — the Statue of Liberty, the Empire State Building, Rockefeller Centre with it’s Top of the Rock Observation Deck, Central Park, Madison Avenue, the Miracle Mile of Museums and more. In order to maximise your time in the city, you may want to purchase a ‘3 Day New York Explorer Pass’ that provides discounts for 16 major New York attractions. The choices include a City Lights Evening Cruise, a Hop-On Hop-off Double Decker Downtown Bus Tour, an NBC studio tour, as well as other major attractions. Today art lovers can risk sensory overload at the Metropolitan Museum of Art with 2 million works of art from around the world and the Museum of Modern Art, dedicated exclusively to contemporary art. History buffs should be sure to tour the American Museum of Natural History where there is always something new to see. The Ellis Island Immigration Museum holds another fascinating story. Travellers who have visited New York before can get off the beaten path. We can fill your Personal Travel Portfolio with wonderful, but little known attractions like the Cloisters, the medieval collection of the Metropolitan Museum of Art and some wonderful gardens. In fact, there are enough great gardens to spend your entire visit in New York outdoors. Don’t forget about Broadway and Lincoln Centre for evening entertainment. Today you have plenty of time before your evening flight home, so make sure you’ve ticked off all those attractions from your ‘Manhattan Must See’ list. Then take a cab to JFK airport (a yellow metered taxi will cost approx $45 – this is not included in your prepaid holiday cost) before catching your non-stop flight back to the U.K. Enjoy free GPS on your New York and Philadelphia fly drive. Other operators will charge hundreds of dollars for GPS – with Complete North America you pay nothing!